PC laptops can be crazy cheap, but there are lots of good reasons to spend a little more. Our friends at Laptop Magazine explain that you'll get a big boost in performance if you're willing to splurge on better hardware. These days, you can purchase a passable laptop for little more than the cost of an iPad. As of February, the average Windows notebook cost just $513 and, for less than that, you can find a strong system that comes with modern specs like a Core i3 CPU, 4GB of RAM and a 500GB hard drive. But just because you can grab a low-rent laptop for $399 at Best Buy doesn't mean you should. Our friends at Laptop Magazine explain. You can never be too rich, too thin or have too many pixels, but unfortunately most notebooks today come with lame 1366 x 768 screens that show even less of your favorite Web pages above the fold than their 1280 x 800 counterparts from 2007. When it comes to surfing the Web, editing documents, sending email or viewing photos, it's all about vertical real screen estate. Having 900 vertical pixels instead of 768 can allow you to see an additional paragraph or more of text without scrolling. When you're not scrolling all day, you can read more and get more work done. If you're purchasing a MacBook, make sure to buy one with at least a 1440 x 900 resolution (MacBook Air 13-inch, MacBook Pro 15-inch or higher). If you're buying a PC notebook, spend the extra money to get a screen that's at least 1600 x 900. And if your notebook is 15.6-inches or larger, try going for a 1920 x 1080 resolution display. On sites that provide configure-to-order notebooks, the cost delta between a 1366 x 768 screen and a 1600 x 900 screen is anywhere from $50 to $100. For example, HP.com charges $100 to upgrade the $579 Pavilion dm4t's screen to the higher resolution, while Dell charges $50 to up the $499 Latitude E5420′s screen to 1600 x 900 and $150 to move the XPS 15′s screen from 1366 to 1920 x 1080. The one caveat is that many of the systems that come with a higher-res screen option are marketed as business notebooks, but that's no reason a consumer couldn't buy and enjoy them. Every second you sit there waiting for your computer to boot or Photoshop to load is bringing you a second closer to the end of your life. Why not use those seconds to do something more rewarding, like opening more applications? The speed delta between using a traditional hard drive and an SSD is greater than the difference between riding a Big Wheels on a cobblestone road and racing down the Autobahn in a Porsche 911. In our tests, our favorite SSD, the Samsung 830 Series, took less than half the time of a 7,200-rpm hard drive to open a 500-page PDF in Adobe Reader X (3.8 vs 7.1 seconds), and less than a third of the time to open a Excel 2010 to a large spreadsheet (4.2 vs 14 seconds) and to launch Photoshop CS 5.1 with a 400MB TIF (8.4 vs 25.9 seconds). What can you do with the extra 17.5 seconds you won't be waiting for Photoshop to open? How about opening 17 more browser windows (at less than 1 second each), reading five more tweets from your friends or observing 1.7 billion particle collisions? Unfortunately, the price delta between buying a notebook with an SSD and a hard drive is significant, but anything around $200 for 128GB of storage should be considered good. For example, Lenovo charges a reasonable $180 premium to upgrade a ThinkPad Edge E420s to SSD while Dell charges $230 to bump the Latitude E6420 to SSD. In those cases where the premium is unreasonably high, look for preconfigured models with an SSD built-in like the $849 Toshiba Portege Z835. Bottom line: SSDs are worth the money because you're buying time. Unless you're buying an 8-pound notebook you plan to leave on your desk as if it were a desktop, you need as much endurance as you can get. Most low-cost notebooks don't come with enough to juice to last more than 3 or 4 hours on a charge, which is barely enough time to watch a single "Lord of the Rings" movie, let alone write a detailed report for work or school. Whether you're hopping from conference room to conference room in the office, heading from one classroom to another or walking around the show floor at CES all day, you don't want to worry about finding an outlet. Even when you're just lying in bed using your notebook, it can be a real pain to be tethered to the wall or stop to charge every few hours. Save yourself from battery panic by choosing a notebook that gets a bare minimum of 6 hours on a charge, with 8 to 10 hours preferable. High-endurance notebooks like the ASUS U31 series cost a little more than the $500 average notebook price, but when you can get 9+ hours of battery life, spend the money. If a notebook is available with different battery choices, always go for the higher-capacity battery, even if it adds a little bit of weight or sticks out the back. For example, the Lenovo ThinkPad X220 lasts a strong 7 hours and 51 minutes on a charge with its standard 6-cell battery. However, when you pay an extra $30 to upgrade to the 9-cell unit, it lasts an incredible 12 hours and 39 minutes while only adding 0.2 pounds to the laptop's weight and 1 inch to its depth. If you don't mind another 1.5 pounds of weight and another 0.6-inches of thickness, an optional battery slice takes the battery life up to 20 hours and 18 minutes, enough time to fly from New York to Taipei with a 3-hour stopover in Tokyo. When you invest in a new notebook, you want to hold onto it for a good three years, without feeling like it's too slow to run today's apps, let alone tomorrow's updates. 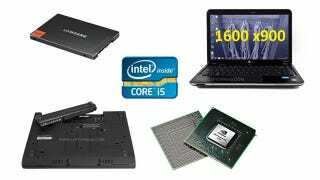 The lowest-priced notebooks on the market use sluggish Intel Pentium or AMD Athlon chips, while many average-priced systems sport modest Intel Core i3 chips. Spring for a system with an Intel Core i5 or Core i7 processor to give yourself enough oomph to crunch videos and spreadsheets today while future-proofing you against the next couple of years of innovation. Core i5/i7 CPUs can turbo boost up to a higher frequency while performing processor-intensive tasks, so your 2.5-GHz laptop can actually overclock itself up to 3.1-GHz while you're playing a game. The cost delta between Core i3 and Core i5 is fairly minimal in most cases. The price difference between a Dell Inspiron 14R configuration with Core i5 and one without is just $70 on Dell.com. However, when you jump up from a bargain basement Intel Pentium CPU, you pay a larger premium. For example, HP.com charges $170 to upgrade its Pavilion G6t from Pentium to Core i5. Spend the money. While the integrated HD 3000 chip on Intel's 2nd Generation Core Series processors offers decent graphics performance for everyday tasks and video playback, many applications benefit from discrete graphics. Though we're able to run "World of Warcraft" at modest settings on integrated graphics, we don't even bother to test out serious titles like "Crysis" or "Batman: Arkham City" without a dedicated Nvidia GeForce or AMD Radeon chip on board, because those games won't be playable at even low settings. When you have a discrete chip, you can also achieve significantly better performance in photo and video editing apps, as many are optimized to run filters, compress files and show previews more quickly by using the GPU. More importantly, the latest Web browsers have hardware-accelerated graphics capability that affects the playback of next-gen Internet applications. More and more sites are adding 3D elements and animations that run so much smoother with discrete graphics. Check out Microsoft's Beauty of the Web site to see some great examples. The cost of upgrading from integrated to discrete graphics is usually in the $75to $150 range for vendors that sell configure-to-order or sell notebook configurations with this feature. For example, HP.com charges just $75 to upgrade from integrated Intel HD Graphics to an AMD Radeon HD 7470M GPU when you buy the Pavilion dv6t.